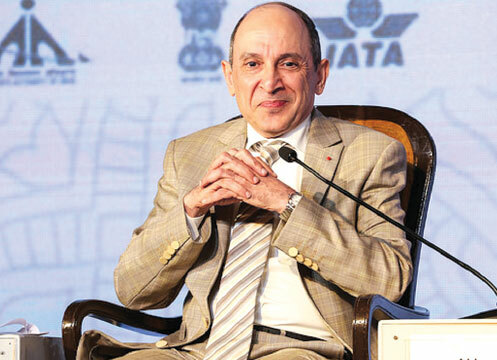 Qatar Airways Group Chief Executive, Akbar Al Baker, addressed key leaders in the aviation industry including government officials, airline CEOs, aviation industrialists and senior dignitaries among others, as part of the International Aviation Summit, a two-day event taking place in New Delhi, India. Al Baker spoke at a panel discussion titled, ‘Can India be a global aviation leader?’ alongside India’s Minister for Commerce and Industry and Civil Aviation, Shri Suresh Prabhakar Prabhu, as well as the CEOs of KLM, Kenya Airways, Spicejet and Jet Airways. The panel discussed the aviation operating environment in India and the opportunities that exist for the market to become the third largest globally by 2025. The International Aviation Summit in Delhi, India was organised by the Airports Authority of India (AAI) and the Ministry of Civil Aviation (MoCA) in collaboration with the International Air Transport Association (IATA) to discuss the importance of the Indian aviation market, and what it will take for the aviation sector to expand in India while maximising the economic and social benefits of the potential growth. Akbar Al Baker, said, “The State of Qatar and India share a substantive and strong relationship that has evolved over the years, making India an important market for Qatar Airways. This is reflected by the 102 weekly flights we provide to 13 destinations across India. In April 2018, India’s domestic aviation market celebrated its 44th straight month of double-digit growth, and expects to celebrate the 50-month achievement of double digit growth by October 2018. Consequently, the International Aviation Summit focused on key issues that India needs to address in the future, such as airport infrastructure, capacity constraints in Mumbai and taxes to name a few, in order to sustain its linear growth. In June 2018, Al Baker commenced his duties as the Chairman of the Board of Governors (BoG) of prestigious global aviation industry body, the International Air Transport Association (IATA), for a one-year term. Al Baker is the 77th chair of the IATA BoG. Qatar Airways currently operates 102 weekly flights between Doha and 13 destinations in India, including Ahmedabad, Amritsar, Bengaluru, Chennai, Delhi, Goa, Hyderabad, Kochi, Kolkata, Kozhikode, Mumbai, Nagpur and Thiruvananthapuram. Qatar Airways introduced its revolutionary Qsuite Business Class services on the Mumbai and Bengaluru routes in July 2018, both of which are being served by a Boeing B777 aircraft.